What’s Missing in the Health Care Debate? The drumbeat on the left for single-payer health care is getting louder, pushed by Democratic luminaries and congressional hopefuls, all trying to make it a major issue this fall. That’s no surprise. Health care as a political and policy issue has been a front-burner concern for almost a decade, with both parties failing to find a solution that addresses access, quality and affordability. The Democrats’ Affordable Care Act failed to meet its own goals because its structural framework treated health care like a commodity. Once the inevitable law of supply and demand came into play, the system was doomed to fail, and it has. Meanwhile, Republicans have also failed to find a macro solution to one of the most perplexing and difficult policy issues facing the country. So it’s not surprising that voters, frustrated and angry with the current system, seem ready to try almost anything, including single-payer, even if they aren’t sure about the implications. With the midterms looming, health care remains a top concern. In our June Winning the Issues survey, 52 percent cited health care when asked what posed the most difficulty in terms of cost of living. That was more than taxes (30 percent), food costs (21 percent), gas prices (20 percent), utility (17 percent), or mortgages (11 percent). In the August Winning the Issues survey, people ranked health care/prescription drugs (19 percent) on par with economy/jobs (18 percent) when asked what would decide their vote for Congress. That same survey found that voters’ concerns over the ACA (45 percent favored, 43 percent opposed) had not translated into trusting Republicans to handle the issue — 51 percent said they had more confidence in the Democrats, 34 percent picked Republicans. This, despite GOP efforts, both legislatively and administratively, to find fixes to some of the ACA’s most egregious elements over the past year. Those include a repeal of the mandate, the two-year delay of the medical device tax, the suspension of the health insurance tax for 2019, and the administration’s support of association health plans. But even though Republicans have had their struggles, Democrats are not unified on a direction for health care either. 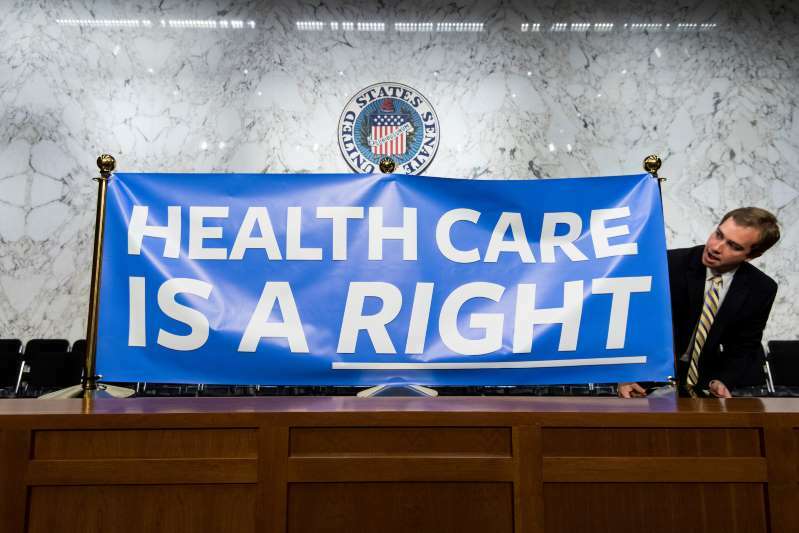 A recent study by the Brookings Institution found that only 32 percent of more establishment Democratic candidates endorsed single-payer, compared to 71 percent of progressives who did. With that lack of internal resolution on their signature policy issue, Democrats hoping to win a majority this November should be careful what they wish for because they just might get it. And it seems equally clear at this point that they don’t have a “Plan B” that both wings of their party can support. Déjà vu all over again, circa 2008. A big part of the problem for both parties is that policy discussions around health care have been almost entirely about cost. It’s been more about how to refinance health care rather than how to reinvent it. Both parties continue to treat health care as purely an accounting problem, focused on the basic question of how to lower costs for average Americans. Rising health care costs are problematic, but even more challenging is the fact that people don’t see their health care as a commodity to be bought and sold. They see health care in very personal and unique terms, different from spending to buy a car or a new pair of shoes. This is why, under the current system, it has been difficult to get people to be more cost-conscious about health care decisions. Take a 50-year-old man with a failing heart. Unless he’s paying out of pocket — in which case price might be a bigger factor — he’s not likely to go for a cheaper procedure at Al’s Heart Transplant Barn rather than the best surgeon he can find, especially when insurance picks up the tab. Single-payer doesn’t fix that dilemma. It only passes on the problem to the government. And if Britain, Canada and other single-payer societies are any example, the system will inevitably be overwhelmed, limiting access and pushing government to more intervention and more taxes to keep the ship afloat. A single-payer system also has major tax implications, and certain states have already tried — and failed — to implement single-payer primarily over cost reasons. A recent study by the Mercatus Center estimated that Sen. Bernie Sanders’ single-payer proposal would increase federal spending by $32.6 trillion over a 10-year period. Another study by the Urban Institute found similar results. What is being left out of the single-payer debate, however, is the impact of this kind of system on innovation and its ability to deliver new approaches that can reduce costs while offering improved treatment. Take Alzheimer’s, for example. According to the Alzheimer’s Association, 5.7 million Americans are currently living with the disease, with the number expected to rise to nearly 14 million by 2050. Meanwhile, the annual cost for health care, long-term care and hospice care for people with Alzheimer’s or other forms of dementia will increase from $277 billion in 2018 to more than $1.1 trillion in 2050. Beyond these figures are countless caregivers and families who are also affected by the disease and many others. Finding cures or effective treatments could have a tremendously positive impact on patients and their caregivers, both in terms of quality of life and ability to contribute to society, as well as on our health care system. In July at the Alzheimer’s Association International Conference, scientists presented a new drug that offers hope for a treatment for the deadly disease. Breakthrough research like this is changing the calculus for health care reinvention. For policymakers, these kinds of examples need to be part of the discussion on health care — including costs — and the broader vision of what the health care system needs to be in the future. Republicans took a step in that direction with the passage of the 21st Century Cures legislation in 2016 that garnered bipartisan support. Government — particularly through the National Institutes of Health — can certainly play a positive role in bringing breakthroughs closer to reality. But ultimately, in a dynamic and patient-centered health care system, it will be the private sector that delivers the innovation and technology the country needs. For those who oppose single-payer in favor of a private sector-based system, the best way to make their case is to point to the impact on quality and innovation. There’s no better example of what too much government intervention can do than the Obama administration’s decision to slap a tax on medical devices as part of the ACA — a totally counterintuitive action if your goal is to encourage innovation and technology. Looking ahead, the question is not simply what a Republican or Democratic health care plan would do. It is how we move from a conversation only about refinancing health care to a conversation about reinventing health care. Politics - U.S. Daily News: What’s Missing in the Health Care Debate?